Lilly Million is a Singer, Songwriter, guitarist and all-round creative, she is married to Christian rapper Blaque Nubon and is based in Midrand, South Africa. 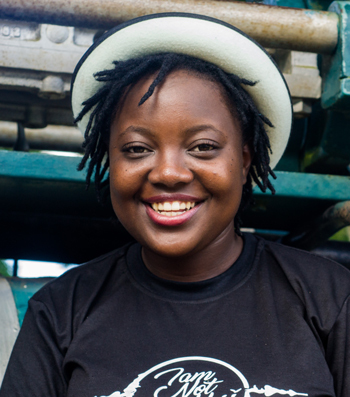 She has worked with artists such as Mag44, Abel Chungu and a spoken word poet called Jannette…ikz. 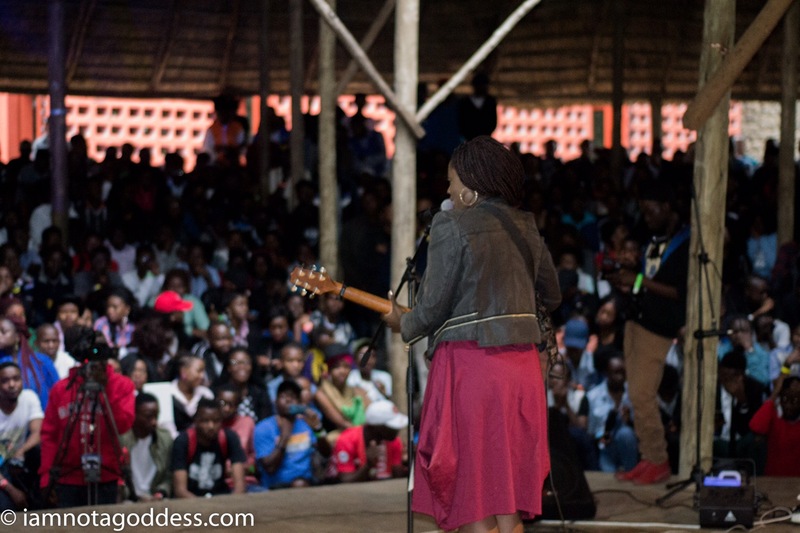 While on tour with Da Truth here in Malawi, I got to chat with her about her journey in music and her recent album “Crazy believer”. She is an amazing singer, but I got to find out through talking with her (on and off the record) how much of a great person she is, which made me appreciate her music so much. Hope you enjoy being part of this conversation as much as I did. I’m from South Africa, JHB, I live in the greater JHB in Midrand. I’m a singer, songwriter and guitarist and an all-around creative because I actually studied motion picture; film, writing and directing but I felt my calling was in music but it seems like the film and directing thing is coming up again. I’ve been doing music for about 7 years, I started writing music at the age of 13/14, by 16 I knew it was what I wanted to do. For me it was more than just about wanting to be famous or wanting to just sing, it was about having a message. When I released my first project, I was a Christian by my project wasn’t really Christian it was very inspirational art and life music. But when I really understood the gospel and released that although I went to church I really didn’t understand the gospel, but in 2013 was when I really got it. And that’s when I started writing Christian music, and it came as a surprise because I thought that was for super Christian’s lol! And now here I am, I have been doing Christian music for 4 years, and God has challenged me in so many ways because when you are writing with a Christian message you have to really think about what you are saying. It’s so much more than just singing. What has the response been like to your music? The general response has been positive, my first album wasn’t a huge takeoff and when I started doing Christian music it was kind of like ‘okay Lord take me where you want to take me, I’m here’. And God has opened so many doors and so many opportunities to travel especially across Africa got to meet different artists that I really respect. And also seeing what other African Christians are doing, especially coming from South Africa where it’s not very Christian, you wouldn’t have the kind of events that you guys have here because even Christian Hip Hop is unheard of. While for us there is a few of us that are trying to build everything from the ground up, getting the message across is hard because it’s really tough soil. This trip here, the response has been insane, I had the impression that I had no reference point like I would just open for Da Truth and that’s it but people knew the songs. And even those who didn’t be so for it would figure the songs out and sing along in, like the show in Mzuzu and they learnt the sang along to every single song. And the energy here, there is this hunger and zeal, its things like that, that give me the zeal to go on and go back home and continue to build. How important is having a growing relationship with God to you as an artist? It is extremely important like you said SA is very influential. So even Christian artists can be influential when they take a stance on certain things. A lot of artists are influential, and there is a desire for the platform but not really bear the responsibility for it, and I am so about that responsibility. One of my best friends who is an Actress in SA always used to say, I would really hate it for me to make it big and for people to meet me but be disappointed at who they meet because I am the complete opposite of who I say I am. And that has stuck with me because I would different Christian artists and realise they are not who they say you are. And I think that starts to happen when you stop being accountable to God, your church family and the people that hold you up in the faith and you get caught up in the fame. Especially because the person on Facebook doesn’t know when you are not in your word or struggling with sin but it’s so important to have people that keep you grounded and to never lose the love for Christ and the gospel. That’s what I do when I go through up and down seasons am struggling and especially because I am a very emotional person and I feel everything deeply but I have such a solid group of friends who keep me accountable and my mother always reminds me of my purpose. And really just get in the word and be connected, because it is possible when you understand the gospel somewhat in depth to ride on that wave, but there reaches a point where you can’t ride it anymore, and you become empty and resentful and bitter and can even hate the gift that God gave you. It is important to be plugged into a church where I can just be myself, and no one is really going ‘oh my gosh Lilly!’. I appreciate the support and love but I can just be myself and even if it’s a bad day, I can just be like ‘today is a bad day’. Now let’s talk about your new album, Crazy Believer, tell me about that? The title crazy believer, I have a friend from varsity, who denounced the faith and started saying horrible things about it. And in one of his posts, he was talking about how Christians are stupid for believing this stuff, he actually said, ‘you must be crazy if you believe this stuff ‘especially if you are a black person. And I was like ‘crazy believer’ that’s really cool I like that because when you think of it, the gospel is crazy like that. It’s crazy to think that God who has been there for the beginning came in the form of a man in a small body of cells. It’s such a scandalous concept and the entire concept of salvation and grace. That’s where the title came from, it’s actually a song on the album titled Crazy believer. My EP and first Christian project it was called the traveller’s Rest was mostly acoustic guitar and vocals, so for this album, I wanted to create an album that a non-Christian can appreciate because it doesn’t sound ‘churchy’. Especially coming from my context where the group of us making urban Christian music I can literally count on both my hands, so all it is mainstream content. I wanted to create something that someone who is not a believer can actually say ‘let me listen to this’, especially again coming from my context where Christianity is sort of compartmentalised, you have work, church, the partying and friends where Jesus is not really at the centre. You see it in how Friday night people will get drunk, party and be vulgar and come Sunday the playlist changes and we are in our Sunday clothes and we go to church to worship the Lord. It perpetuates this idea that Christianity is a Sunday thing, so with my sound, I wanted to say this is an everyday thing, Christian music is not a sound, it’s God’s idea, and music is God’s idea as with everything else. So that’s what I am trying to do and I made it very accessible and it’s not a typically gospel album but the gospel is very much in there. And it’s been well received especially outside South Africa. And the whole album was produced by Mag44 from Zambia. Oh yeah! I saw that in the credits that every song on the album is produced by him and I was going to ask. So what’s that about? So, I met Mag44 for the first time when I was doing the song with David Kalilani in 2013/14, and when I met them everyone was talking about this producer from Lota House. And when I listened to Pompi and Abel Chungu and what struck me was this guy’s diversity, like this guy produced ‘love unleashed’ and ‘let’s have church’, those are two very different sounds. It was kind of my dream to work with Magnus, and my manager then Harold Moyo called me and was like “I think you should go to Zambia and work with Mag” I was like ‘Yes! I’ve been thinking the same thing’. So they worked it out and in 2015 I went to Zambia for 2 weeks to work with Mag. And he recorded and produced everything, I would just give him the song and what I was working on because I write all my songs on guitar first, and then he would just do his thing. And it came out exactly how I wanted to be and the entire experience was amazing! My facebook page is Lilly Million and @Lilly_Million on Instagram and Twitter. Hope you enjoyed getting to know a bit more about Lilly Million, you can follow Lilly Million on Facebook, Instagram and Twitter as @Lilly_Million and watch her on YouTube especially her video He is Love directed by our very own Sukez.